The multicomponent reaction (MCR) is an important research field in the organic synthetic methodology. In 1956, Professor Friedrich Asinger reported a method for synthesizing thiazoline scaffold, in which a ketone was treated by sulfur and ammonia in one-pot operation. In 1998, Professor Katrin Groebke, Hugues Bienayme, and Christopher Blackburn reported a method for preparing imidazo[1,2-a]pyridine, in which an annulation took place among α- aminopyridine, aldehyde, and isocyanide in one-pot operation, and then the reaction was entitled as Groebke reaction. Comparing with the bloom in the research of other MCRs such as Strecker (found in 1850), Hantzsch (1882), Biginelli (1891), Mannich (1912), Passerini (1921) and Ugi (1959) MCR, as newcomers in the family of MCR, Asinger and Groebke reactions are not reported as usually as other MCRs. The aim of the present review is to emphasize the importance of these two MCRs in the synthesis of thiazolines and imidazolines. Although the Asinger protocol is innovated as the reaction of α-halogensubstituted ketone with thioamide, or, the C-S bond in thiazoline is contributed from mercapto or thiocarbonyl groups, as well as β- aminothiol as the synthon reacts with carbonyl compounds to form the thiazoline scaffold, the advantage of Asinger reaction is still worthy to be noted because four bonds in thiazoline are produced simultaneously from the reaction of ketone with the simple reactants, sulfur and ammonia. On the other hand, the review on the Groebke reaction is herein catalogued as substrates and catalysts. The 2- aminopyridine-type substrates are the necessary reagents for the Groebke reaction and therefore limit the applicability of the reaction, but some efforts succeed in applying catalysts for enlarging the suitable substrates or agitating the following reactions based on the Groebke adducts. 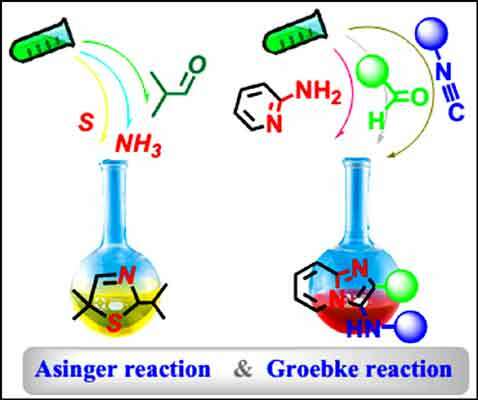 To sum up the present achievements on Asinger and Groebke reaction, it can be concluded that the exploration on catalysts will break the limitation of the substrates and bring them with wide application in the synthesis of thiazolines and imidazolines. Asinger reaction, Groebke reaction, imidazoline, multicomponent reaction, thiazoline. Department of Organic Chemistry, College of Chemistry, Jilin University, No.2519 Jiefang Road, Changchun 130021, China.